Shelley Gray joins up with 3 of her fellow Historical writers to bring us a TRUE treat! Among the Fair Magnolias is the newest collaboration from Thomas Nelson and it is FANTASTIC! Shelley Gray gets together with Tamera Alexander, Dorothy Love and Elizabeth Musser to bring us four wonderful Love stories – each with a touch of mystery! To Mend a Dream by Tamera Alexander is your typical “orphans out on their own, lost their family home, desperate to make a better life for themselves” story. Except it ins’t typical AT ALL! Tamera Alexander hooks you with the first sentence and doesn’t let go until the very last one! An Outlaw’s Heart by Shelley Gray is a romance with more than one twist. Shelley uses her exceptional talent for romance and combines it with her flair for suspense to intrigue her readers! A Heart So True by Dorothy Love is a story of the age old problem; Do I follow my heart or my family’s wishes? I refuse to spoil it for you – it’s JUST TOO GOOD! Love Beyond Limits by Elizabeth Musser involves a favorite storyline of mine! It’s always a struggle to try and decide whether you should take a chance on love, but when you have the added impossibility of forbidden love, it’s a journey that you DO NOT want to miss! During the most turbulent decade of our nation’s history, four Southern women—their destinies forged by birth and heritage—face nearly impossible choices on their journeys in life . . . and in love. Savannah Darby would do almost anything to revisit her family home. So when the new owner Aidan Bedford seeks to redecorate the house for his fiancée, Savannah jumps at the opportunity. But can she find the box her father supposedly hid there during the war before her assignment is completed? And before she sees yet another battle lost on the home front—this time, a battle of the heart. Seven years ago Russell Champion was betrayed by the two most important women in his life. Now Russell returns home, but is it too late to make amends with his mother and find closure with his true love? Abigail Clayton hopes to reconcile with Dr. Wade Bennett and become his wife. But her father insists she marry her distant cousin Charles Kittridge so the plantations of the two families will be joined. With her wedding looming, Abby must choose between duty to her family and the yearnings of her own heart. 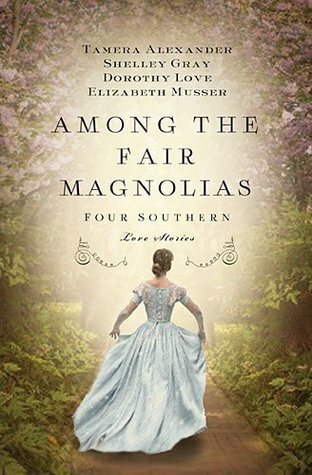 Emily Derracott loves her childhood friend Thomas McGinnis, but she cannot marry a man who doesn’t share her strong convictions about the freedmen. Besides, she harbors a secret love for someone else. But the prospect of becoming his wife is not only improbable—it is completely impossible. You can find even more at the links below – including how to purchase your own copy! I was blessed to receive this book free in exchange for an honest review. Next > “Harvest Festival” | Newest installment in the wonderful series that has been continued by the talented Mike Berenstain!